This extra-illustrated scrapbook contains autographed letters, pamphlets, sermons, photographs, engravings, and this theater playbill for "Our American Cousin", April 14, 1865, Ford's Theatre, announcing President Lincoln's presence as a guest. During this performance, Lincoln was assassinated by John Wilkes Booth. John Russell Bartlett, a prominent figure of 19th-century American Literature, is still praised for his The Literature of the Rebellion and Dictionary of Americanisms, which is frequently cited by the Oxford English Dictionary. Lehigh University acquired some of the Civil War-related works from Bartlett's library in 1884. They are included this unique volume. 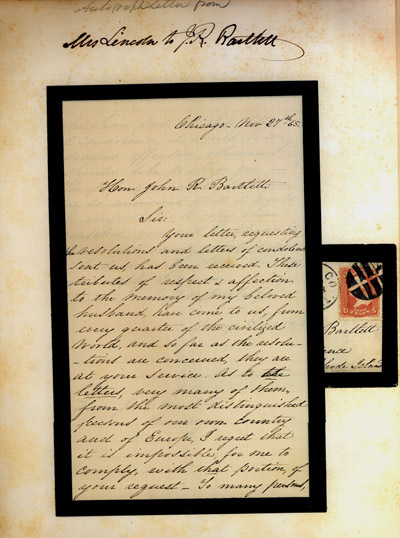 Displayed here is a copy of a letter from Mrs. Lincoln, dated November 27, 1865, replying to Bartlett's request for resolutions and letters of condolence to assemble this Lincolniana. 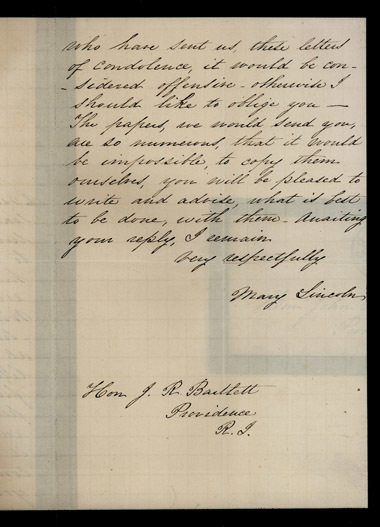 Mary Lincoln's letter to Bartlett, p.2.